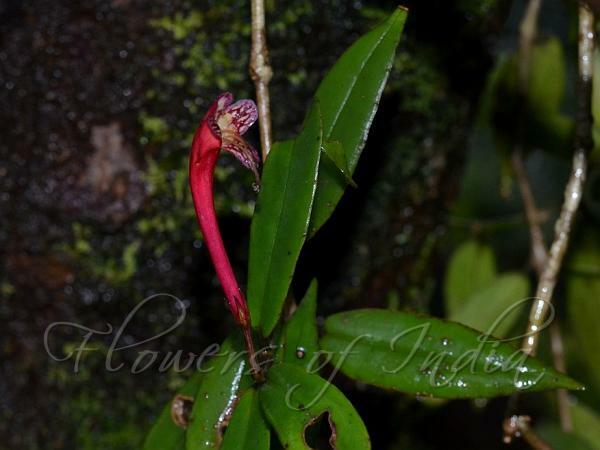 Nilgiri Blushwort is a climbing shrub, found growing on trees. Stem is hairless, leaves oppositely arranged, 6-8 x 1.2-1.5 cm, elliptic, succulent, pointed, rounded or acute at base. Leaves are pale below, stalk about 5 mm long, lateral nerves obscure. Flowers are borne in leaf axils axillary, solitary or paired, on stalks 1-1.3 cm long. Sepals are 4-5 mm long, linear-lanceshaped. Flowers are scarlet, petals streaked with white, 3.5-5 cm long, tubular, curved, widening above, oblique at mouth, petals 5, nearly equal, ovate, blunt, glandular-ciliate. Stamens are 4, all perfect, filaments 2-2.5 cm long, free, staying well inside the flower tube. Ovary is long-stipitate, linear, 1-celled, ovules many, style slender, stigma terminal. Capsule is to 15-20 cm long, linear; seeds linear, many. 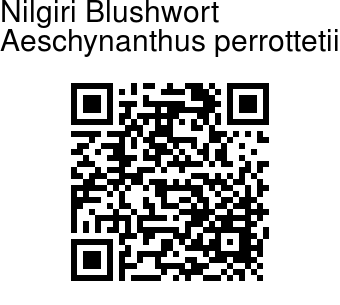 Nilgiri Blushwort is found in Western Ghats. Identification credit: Anurag Sharma, Ravi Chandran Photographed in Coorg, Karnataka.